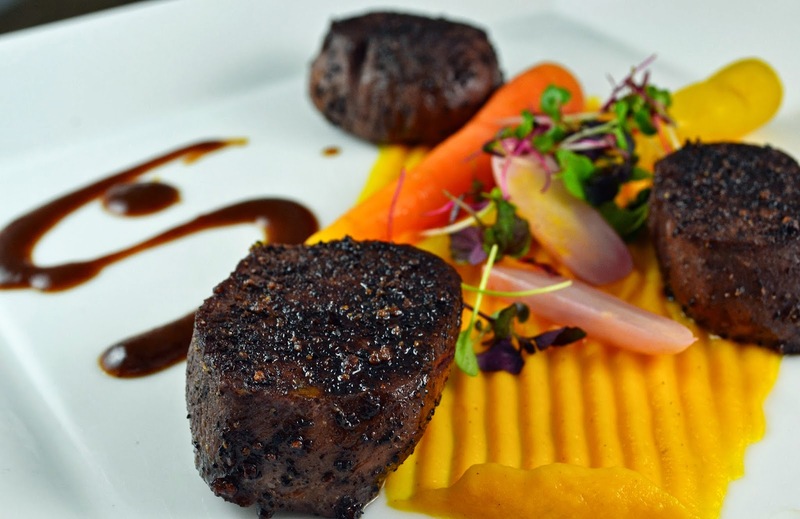 Venison, or deer meat, has enjoyed a rise in popularity lately as the cost of beef rises and a growing demographic of health-conscious consumers seek out lower-fat options. Venison has a deep, rich flavor which can be similar to beef, though it can sometimes have a “gamey” note and even more tender cuts can be tough comparable to beef or pork. Both of these characteristics can be overcome with proper handling, though. For this dish we prepared the venison sous vide, allowing it to cook at 137 degrees Fahrenheit for 1.5 hours to allow connective tissues to slowly break down without the risk of over cooking. The loins were cooked whole and then chilled, then portioned once cooled. When we were ready to serve the dish the individual medallions were seared on high heat, then seasoned with the espresso and cacao nib rub. Applying the rub before searing will cause the rub to burn and create an unpleasant, bitter flavor. On the subject of game, last week I was privileged to spend some time with an authority on the subject. Chef Dan Hugelier has spent over fifty years in professional kitchens, is a Certified Master Chef, and was a member of the only Culinary Olympic team in history to gold medal in hot food three times consecutively. Chef Hugelier has created a great retail line of spice blends called “Wild Season”. Wild Season will soon become a staple in our kitchen, and you can visit Chef Hugelier’s shop here if you would like to bring some of his experience to your own kitchen. Posted in Entree, Game, WinterTagged cacao, espresso, venisonBookmark the permalink.